PARIS: In Mandarin, Emmanuel Macron’s name is rendered “Makelong”, or “the horse vanquishes the dragon” — an encouraging image for the French president as he heads to China on Sunday hoping to forge closer ties with President Xi Jinping. 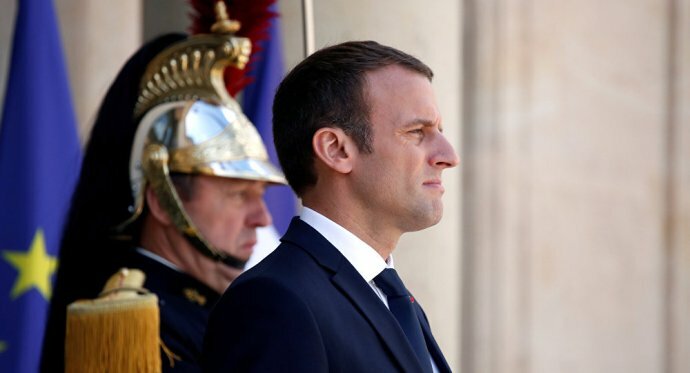 During the three-day trip which begins on Monday, Macron plans to seek a “strategic partnership” with Beijing, notably on terrorism and climate change, an official in the president´s office said. In particular, France is hoping Beijing will join it in playing a decisive role in implementing the Paris accord to fight climate change after the US pullout pledged by President Donald Trump. Although China is the world’s biggest polluter, it is also the biggest investor in clean energy technologies. Macron also said this week that China had a key leadership role to play in easing the crisis provoked by North Korea´s nuclear programme, following Trump´s escalating war of words with Kim Jong-Un. “The ambition of the Chinese leadership is to persuade the French president to position himself on issues like North Korea as a ‘go-between’, defending ‘dialogue’ against the more aggressive posture of the United States, and to implicitly recognise by his choices the pre-eminence of China in the region,” analyst Valerie Niquet said. Macron will also ask Beijing to help support the G5 Sahel force being created with forces from Mali, Chad, Burkina Faso, Niger and Mauritania, tasked with fighting jihadist forces spread across an area of desert the size of Europe. China has already become a key business partner across Africa, with total investments reaching $31.6 billion in 2016 in projects including railways, highways, ports and power stations. They are part of the extensive network of transport links Xi is developing as part of his “One Belt, One Road” initiative for increasing trade. The state visit will be the first by a European leader since China´s Communist Party conference in October, which reinforced Xi´s grip on power as he was formally handed a second term. China has praised Macron´s decision to make it the first Asian nation he visits. “We hope this visit will reinforce mutual political confidence and strategic communication,” China´s foreign minister Wang Yi said this week. Macron will be travelling with a delegation of business executives hoping for a bonanza of contracts, including from AccorHotels, LVMH, Airbus and BNP Paribas. “We will be signing an exceptional number of strategic deals, about 50,” the official said, including sales of Airbus planes and Safran jet engines. State nuclear giant Areva is also negotiating a contract to build a reprocessing site for radioactive waste. France is pushing to “rebalance” its trade relations with China. Although China is France´s second-biggest supplier of goods, it ranks eighth in terms of the top buyers of French goods. That leaves France with a Chinese trade deficit of 30 billion euros ($36 billion) it’s biggest with any trading partner. “Paris intends to seek a rebalancing and market access, for example in financial services,” the official at the Elysee palace said, at a time when major French banks are hoping to tap into the rapidly expanding Chinese market. The two leaders also plan to announce a French-China investment fund worth 1 billion euros which would help midsize companies, mainly from France, get a foothold in China. Accompanied by his wife Brigitte, Macron will begin his visit in the northern city of Xi´an, “an important symbol because it is the cradle of Chinese civilisation, and the starting point for the ancient Silk Roads,” the Elysee official said. After visiting the terracotta statues of warriors near the city excavated from the tomb of Emperor Qin Shihuangdi, who ruled from 221 to 210 BC, Macron will give a speech on the future of France-China relations. An agreement is also expected to be finalised for a temporary exhibition in Shanghai by Paris´s Pompidou Centre for modern art. Not least, Macron will also be exporting his “Revolution” — the campaign manifesto published in 2016 ahead of his sweep to the presidency. The Chinese edition of the book, in which France´s youngest president lays out his vision for France, hits bookstores on Monday.